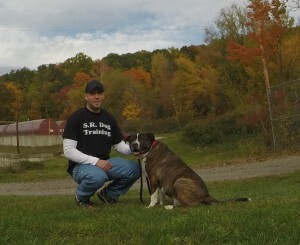 “Steve and his training worked wonders for my relationship with my dog! I truly cannot recommend Steve and his dog training techniques highly enough. At the beginning of our training, Pepper, my year and half old Standard Schnauzer, was out of control. She would bark uncontrollably (and unpredictably) at people, other guests, doorbell rings, etc. It was embarrassing to say the least, and made me not want to walk with her anywhere that I thought I would bump into people (or worse, someone walking their dog). I had lost control of my dog in my own house, she would climb the bed, the couches, grab at food, papers, jump up kitchen counter, etc. and would only listen to my commands when she felt like it. Despite having gone through a major store chain’s 8 week puppy class, another 6 week intro to puppy manner class, and at least 5 private training lessons (at considerable cost), the best I could show for it was Pepper able to sit on command about 75% of the time and “leave it” (not to touch an object) 50% of the time and mainly if I said it loud enough (basically scaring her into not touching it). Despite the above behavior problems (and there were many more), the biggest problem with Pepper was her complete lack of recall. There were two times that I really thought I had lost Pepper for good. One time she escaped by the front door and ran towards the street where cars had to stop to avoid hitting her. I chased after her but she would not come back, nor come when I called her. This lasted about an hour and then I was able to get her back inside the house. The second time she escaped was around midnight and this time I had no idea where she was. Two hours later we were able to get her back by placing a trail of cooked steak leading to the front door! Needless to say, her lack of a recall created extreme stress, not to mention how dangerous it was for Pepper. It was after that last event that I contacted Steve for help. I initially tried to have Pepper do the two week board and train program with Steve, but it was quickly determined that the program was not a good fit for her because of her Separation Anxiety. I was really impressed with Steve that he didn’t just take my money and “go through the motions” when he felt that Pepper would not benefit from that sort of program. He offered to train her at my house where my dog would feel more comfortable, and thus training more effective. I felt that is one of Steve’s greatest strengths as a trainer, he understands that there isn’t a one size fits all approach to dog training, and he is able to adapt and adjust his techniques to account for the different challenges that exist between individual dog and owner. Anytime I would ask him a question I would get an intelligent answer that showed me that he understands dog behavior, and could tailor a solution to a specific problem, not just rehashing what we can all read in a book or on the web. The change in my dog now is really incredible. It’s hard to do justice with words, but she now listens to me. I can take her out without the same embarrassment as before, I have even had her off leash -something I would never even consider or thought possible. But most importantly, she comes to me when I call her, regardless of what she is doing, chasing, etc. I have now had two times that she has gotten out of the house when someone left the front door open, and both times, without fail she came back immediately after I called for her despite her chasing after a squirrel. Pepper is a year and a half old Schnauzer who was quite a handful for her owners. Pepper is a sweet and friendly dog with too much pent up mental/physical energy and a lot of freedom/lack of boundaries in the home. This contributed to her getting into A LOT mischief in the home. Her owners tried everything they could think of to stop her from: jumping on furniture, eating paper, stealing household items, barking/jumping on guests, and escaping out the front door and running around the neighborhood for several hours. Needless to say, this is very stressful and problematic for her owners, but also a potential safety issue for her. As a result, they contacted me for dog training in Hartsdale NY. Pepper’s owners just had a new born baby and want to improve upon these issues the right way to make their life easier and less stressful. This first thing we did was to begin providing Pepper much needed structured and routine in the home. We went over my structured threshold, crate training, and walk protocol. Once we got her established with that, we implemented my complete obedience training program. 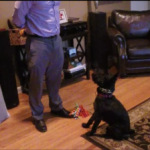 Our goal is to have Pepper off-leash obedience trained using a remote collar as a communication tool. Reliable obedience training provides owners reassurance in knowing that their dog will listen regardless of distractions or if they have a treat. It also enables the dog more freedom and the ability to be off-leash and go more places with their owners. The issues that Pepper’s owners were struggling with are nothing new or unique to them. Whether you are in need of dog training in Hartsdale NY or anywhere else, the important concept is to utilize a safe and effective dog training system that has been proven effective, regardless of breed, age, or size dog. There is no need for you to continue to live frustrated and stressed with your dog. You and your dog can live the happy and stress-free life you have always wanted. 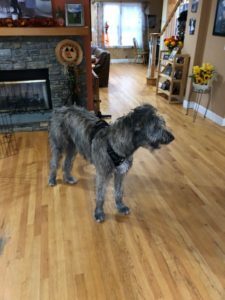 Oisin is a very impressive 120lb. 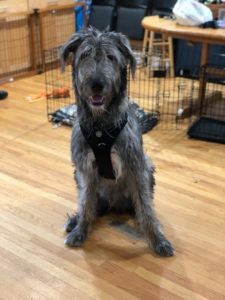 eight month old Irish Wolfhound (these pictures don’t do his large size justice). He certainly is a gentle giant. Oisin loves everyone and has an amazing temperament. His owners contacted me for dog training in Hartsdale NY to work on these issues: Due to his extreme size, he is able to simply put his head on the tables and kitchen counter without jumping and steal any food item he wants. So this is our first priority. From there, we are addressing his destructive tendencies when it comes to destroying the couch, moldings, shoes, etc. Lastly, because of his current size and the fact that he is projected to weigh 150lbs. full grown, we will be improving his over level of obedience, that way his family can easly lead him with their words. Any Dog. Any Problem. Anytime.